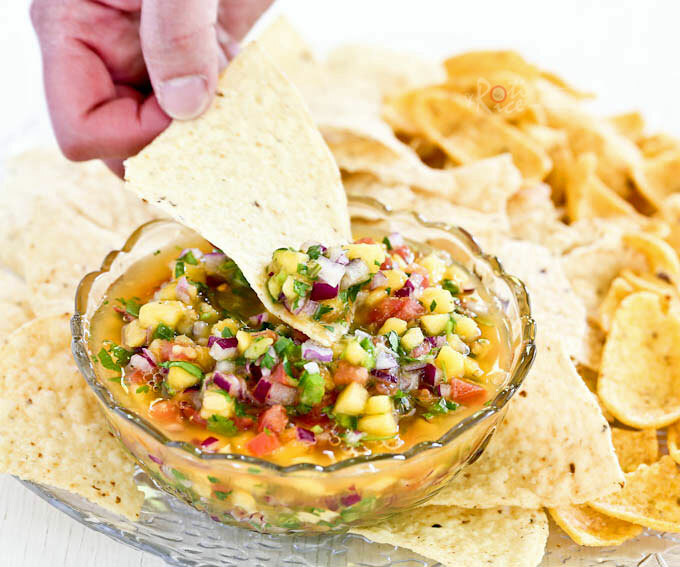 Sweet, tangy, refreshing Mango Peach Salsa. Great with tortilla and corn chips for all your summer parties and get-togethers. 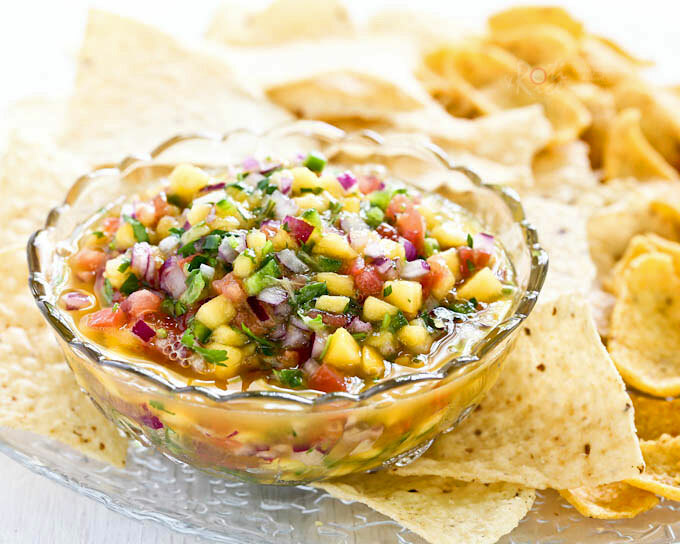 There is no better time to make Mango Peach Salsa than when both fruits are in season, like right about now. These sweet fruits are delicious together. 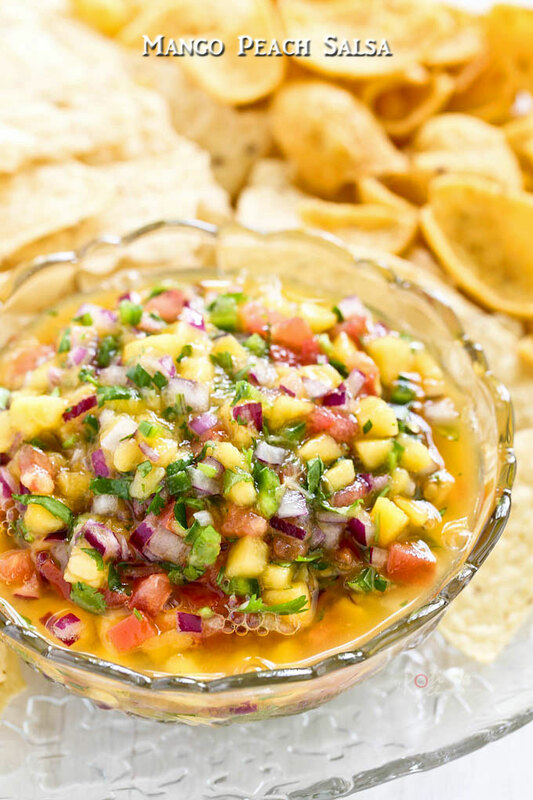 When combined with other traditional salsa ingredients like tomatoes, cilantro, jalapeno pepper, onion, and garlic, they make an amazing salsa. It is sweet, tangy, and altogether refreshing. Perfect with any tortilla and corn chips. This recipe is a keeper. 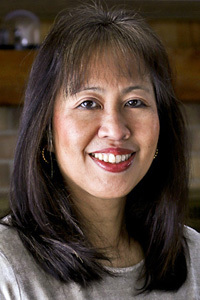 Nectarines may be used in place of peaches if preferred. I used only half a jalapeno pepper to keep it mild. Use the entire pepper for a spicier salsa. Keep refrigerated and consume within 3 days. I think this salsa is best made fresh for the colors and flavor to shine. Place all diced fruits, vegetables, sugar, and salt in a medium size bowl. Squeeze in lime juice. Toss to get everything well mixed. Transfer to a serving bowl.